We have had to arrange an date swap for two of our up-coming tournaments. The reason behind this is because Rosie, who instigated the idea of the Ladies event, presented her marvelous trophy for it, and is so generous in her support for the Ladies Singles, can't make the original date. The date swap means that she will be able to join us on what has become essentially her day and is so much enjoyed by all the Ladies. Hopefully, as these two dates are in the same week, all those hoping to play in one event or other will still be able to do so. Raghu Iyer won our One Ball Tournament today for the second time, infront of an improved line-up of 12 players. Reprising his win in 2014, Raghu was undefeated in five rounds of this Swiss style event and finished ahead of holder Dianne Browne. It was mathematically possible for Raghu to be caught after four rounds of play, but having already beaten his nearest rivals it was unlikely. 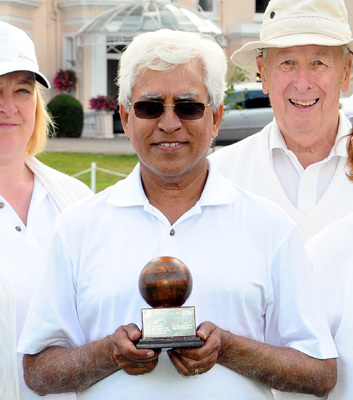 To be sure a fifth round was organised and Raghu beat Christine Searle to move even further ahead and secure the 'Tankard (wooden Ball) Trophy. Raghu Iyer won our One Ball Tournament today for the second time. Richard Peperell won the first game of this four rubbers match for Phyllis Court, and captain Raghu Iyer secured his team a league point for a draw, with his own victory as the evening light faded. Lower handicapped players Chris Roberts and harry Midgley, couldn't live with the bisques of their opponents and each suffered big losses. salvaging a draw in thes circumstances wasn't a bad result. 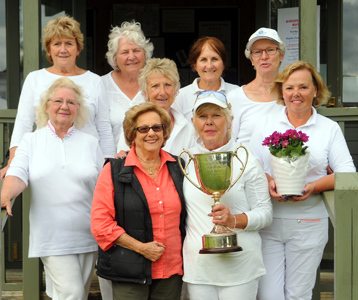 Phyllis Court reached the semi-final stage of the National Inter-Club Championship for only the second ever time, with an impressive victory over a strong Cheltenham team today. Although Phyllis Court were stronger on paper than their visitors (fielding players with handicaps of -2, 0, 0, 1 to Cheltenham's 0, 0, 1, 1), at the half way stage the hosts had a lot to do. Chris Roberts and David Hopkins had lost there doubles rubber to Tony Forbes and Richard Thompson in straight games, partly due to a 'wrong ball' being played at a crucial stage, and Helena Fensome had had no joy in a two game loss to Richard Raby. Fortunately Mike Fensome had salvaged a 2-1 win over Alan Slater, which meant Phyllis Court would have to come back from that same scoreline in match wins, if they were to win the fixture. After lunch, Roberts tied the match 2-2 with a quick victory over Forbes, winning 7-2, 7-2, but all the other rubbers were long drawn out affairs. Helena Fensome was next to finish and beat Slater in a decider, meaning PC then needed just one more win. David Hopkins made on-lookers 'sweat' by going to the 13th hoops with Thompson, but won that point, the rubber (in straight games) and put the match result beyond doubt. Mike Fensome then added the icing with a win in three games over Raby, giving the result of the fixture a very health 5-2 scoreline, which was a tad harsh on Cheltenham. Phyllis Court now face National Champions Ashby (in all likelihood featuring England Internationals Will Gee and Rachel Rowe, the former Women's World Champion). The match will be at home on a date to be decided in the next six weeks. 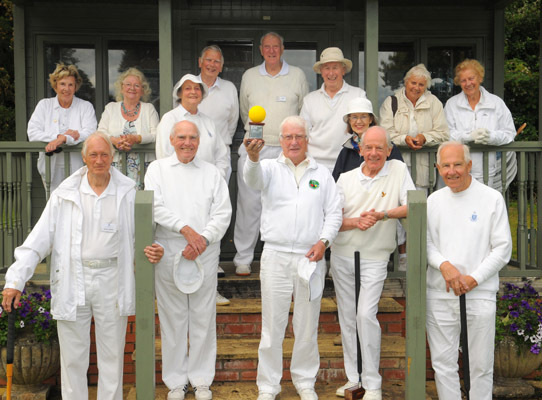 Don Rutherford put a new name on the 80+ Yellow Ball trophy, with an impressive victory over a good field of ten players, several of whom where debuting in this event, having finally become old enough to take part! The field included former winners Robin Morrell and Derek Toms, but the pre-tournament favorite were the 'newly qualified' youngsters Raymond Wood and Colin Morgan. The latter was unlucky with the resolution of series of a 'wrong ball' plays that gifted Morrell tow of the last three hops in their match and that did for Morgan's chances. Wood fell unexpectedly to Rutherford who looked to be cruising to victory undefeated , but he then slipped up to Ray Broadhead and in the final round any one of four could claim the title. Wood beat Broadhead, and Rutherford beat Toms, which gave Rutheford the over-all win ahead of Wood on he who beat whom rule. PCC 'C' scored a great win this afternoon, toppled league leaders High Wycombe and drew praise from their oppoenents for their astute use of their extra turns. Dianne Brown was the 'star' of the day, for in winning both her singles made the difference for the narrow 7-5 score-line. PCC 'A' had their bubble burst well and truly when Winchester wheeled out their big guns, as they were always likely to do at home. A dreadful drive with many traffic problems was hardly ideal preparation for our team who were looking into the abyss at 0-3 down at lunch, with four rubbers to play. It was all over soon enough and attention switched to avoiding a whitewash, and David Hopkins did well to savlage some pride for us in a 1-6 defeat. As Winchester had already beaten usual title contenders Ryde (7-0), one would expect them to go on to win the league now, unless High Wycombe can pull out an unexpected result against them. When PCC 'C' beat High Wycombe days ago, that opened up and opportunity for PCC 'B' to go top if they beat Dogmersfield today. But they could only manage a draw (6-6) and my rue that chance when the final reckoning is done. PCC 'friendly' beat Hurlingham 11-1 in the clubs' annual fixture, this year at Phyllis Court. Delia Norris took charge of our side and was pleased to report, that despite the score-line, the visitors all said how much they had enjoyed their day. 17 July 2016 - Peperell wins the Bath CC B-level tournament! Great news has just filtered through today - Richard Peperell won the Bath CC B-level tournament last week. This qualifies Richard for the B-Level Series National Final, but sadly he won't be able to take up that opportunity as he will be playing croquet in Corfu in October. Congratulations to a trio of Phyllis Court players who have all reduced their handicaps in the past week. David Hopkins went to 'scratch' after some strong performances in outside tournaments and most recently Cup and League matches too. Hugh Crook beat Don Rutherford in the PCC Handicap Singles and 'triggered' to become a 4 handicap for the first time. Dianne Browne's reward for 'scalping' Mary Gaynor was a 30 point rise and a handicap drop to 6. At our 80+ tournament, Robin Morrell finally got over the threshold to handicap 6 (having been on the brink for ages) and good performances by Mike Christmas earned him recognition for the Club handicapper with a reduction for 12 to 10. (GC) PCC 'C' were held to a draw away at Harwell this afternoon, where Philip Allison made a successful debut winning both his singles matches. Iyer had played one of his singles games early, so that he could get a quick getaway to lead our (AC) PCC 'handicap' team at home in the evening, where second draw was recorded in an enjoyable fixture. PCC'A' bounced back from their heavy defeat at Winchester last week, to score a good, if very long and drawn-out, victory over visitors Ryde today. The Islanders are always formidable opponents and the match result was still in doubt well past the middle of the afternoon. In the first round of games Chris Roberts and Ian Norris were held to a draw in the doubles match but David Hopkins and Roger Goldring each won their singles rubber. Hopkins and Goldring turned the same trick in the afternoon and Roberts added another singles win. Ian Norris couldn't quite complete the set of singles win in the afternoon and with the fixture result in no doubt, it was agreed to score the doubles as 'halved'. The final 5.5 to 1.5 shoreline hid the fact that all four of the afternoon singles matches went to deciding games and that Ryde were tough opponents indeed. In a 'shadow' Friendly fixture, Ryde got their own back and won 2-5 (detail to come). PCC 'B''s Handicap league title hopes look a knock today following a heavy 2-10 loss against Wingrave at Leighton-Linslade this afternoon. They will need to win their remaining two games and their match with High Wycombe is looking like being all important! 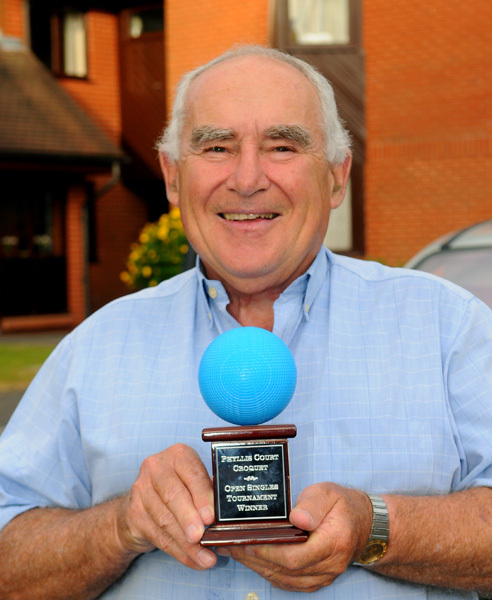 David Hopinks won the Open Singles 'Blue Ball' tournament for the first time on the 'who beat whom' rule, just ahead of Roger Goldring. The pair tied on four wins from five 19 games at the end of a very long day which was one of this summer's hottest, but Hopkins penultimate round win over Goldring was the deciding factor. 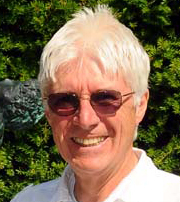 Don Rutheford is to be congratulated for his play today, for although he didn't record any wins, he did score two close 8-10 score-lines against a field who were all at least four handicap ranks his betters. Helena Fensome was undefeated in her five games and retained the Ladies Singles tournament title today. Because of uncertainty about who was playing (and how long for) right up to the last minute, manager Chris, decided to run this event as Swiss, because it is the most flexible. It is rarely a good thing when players forget to sign-up for tournaments, yet pitch-up expecting to play, and very poor practice indeed to enter and then not show up at all (especially if an individual does this more than once!). With an 8-player swiss, the two undefeated players always meet in the third round, which then unbalances games in subsequent rounds - so its far from ideal. Had the manager known that a convienient 8 were going to take part, a better format would have been arranged that would likely have culminated in two undefeated players meeting in and end of the day final. Enough moaning - Helena was the strongest player on the day, was undefeated and won deservedly by two wins clear of three other ladies. She reatined her Ladies title and hold on Rosie Richardson's donated hugh Cup. As Rosie had bought flowers for the runner-up, and those tied had not all played each other, a hoop shoot out from 6 yards was used to decide. Frances Colman scored with her second attempt and neither Delia Norris or Dianne Brown could match that. Mention in dispatches - Madeleine Probert, the outsider on handicap but played very well indeed with some relatively narrow losses and one deserved victory. It was a case of 'nearly, but not quite' at Phyllis Court on Sunday when the National Champions Ashby sneaked the biggest match ever at the Henley Club by the narrowest of margins. Phyllis Court members and visitors lined the courts for the duration of the day long match, and numbered around 60 at the height of the entertainment just after lunch and the total spectator count was nearer 90 throughout the day. The faithful witnessed Phyllis Court holding an unexpected but deserved 2-0 lead at lunchtime, in this National Inter-Club Championship semi-final, which was the first to be played on the Club's riverside courts. Ashby's star England International players Will Gee and Rachel Rowe (the former European Champion and Women's World Champion) were more than matched by Phyllis Court's own Ireland International Charlie von Schmieder and number two player Chris Roberts, who won the morning doubles rubber 2-1. The host's Helena Fensome did very well to beat the higher ranked Tim King in the decider of their singles encounter and the remaining morning singles rubber between Rober Goldring and David Bell, was halted for lunch when poised at 1-1, with amicable decisions then made to suspend its conclusion in favour of starting the afternoon's programme of four fresh singles. Following their doubles victory, von Schmieder and Roberts had high hopes of afternoon singles success against the same opposition, but first Roberts was well beaten by Rowe and soon after his team mate fell, after rather more of a fight, to the fabulously accurate hitting of Gee. The crowed were wooded time and again by the power an constancy of Gee's shooting, particularly when clearing his opponents balls with speedy pinpoint accuracy at huge distances, and the extra catch fencing brought for the occasion was certainly well employed as Gee's balls flew (literally on occasion) around the court. With match tied at 2-2, attention switched to the other court, where the number three and four players were playing their afternoon singles rubbers and both were very close affairs, going to deciding third games. Fensome was eventually undone by Bell, and so the pressure fell on Goldring to save the fixture by beating King. This he managed with aplomb, scoring the penultimate hoop with a shot from nearly 10 yards, to level the fixture score-line at 3-3. As so, it all boiled down to the result of the suspended singles match between Phyllis Court's Goldring and Ashby's Bell. Goldring got the early control, worked and defended a slim lead, but then Bell moved up a gear, leveled at the tenth, sank a 12 yarder from the boundary at hoop 11 and then, with a show-stopper long jump shot, sealed Phyllis Court's fate 3-4. It was fitting end to a fabulous day, enjoyed by both teams and, by all accounts, spectators too. While this was the end of the road for Phyllis Court, winners Ashby now await either Surbiton of Dulwich in the National Final.